Second Baptist Church has embraced the work of Scripture assembly wholeheartedly. World Missions Bearing Precious Seed has been essential in the development of our ministry here since our very first workshop on October 31, 2014. During this short time, the blessings of God have been extremely evident. WMBPS has been used of God for years throughout the Midwest, South, and Southeast to promote personal involvement in global missions. The Seedline, operated by World Missions Bearing Precious Seed, is a network of thirty-two churches that assemble Bible portions for distribution. Second Baptist Church is privileged to be the earthly headquarters and sponsors of this growing work. As Second Baptist was attempting to increase its involvement in the Scripture ministry, God was moving in the lives of two other people towards the same end. Dennis and Lee Deneau were at a turning point. Twenty-one years of service in one place had unexpectedly ended, and all existing options were shut off to them, as well. A mutual friend brought Brother Deneau and Pastor Waymire into contact with each other. On April 6, 2016, the Deneaus joined Second Baptist Church, and World Missions Bearing Precious Seed of Festus, Missouri, was officially established! Brother Dennis became our missionary-evangelist, traveling around the country promoting and raising support for the ministry. They also operate an independent ministry, Church Bible Publishers. The Festus branch worked jointly for two years with WMBPS in St. Robert, Missouri, which was under the direction of Samuel and Barbara Martin. While the work continued to grow, it became increasingly difficult to operate two independent ministries that were partnering together in all of their projects. 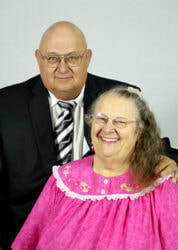 God once again began to work in hearts, directing the Martins to Second Baptist Church. They united with us on March 18, 2018. Brother Martin directs the unified World Missions Bearing Precious Seed of Festus, working with Pastor Waymire and the Deneaus to further the spread of the Gospel throughout the world. For more details about our work, you can visit our ministry website. While we thank God for what He has done through Bearing Precious Seed so far, our eyes are set toward the future. Long-term goals have been set that will enable us to completely produce all materials in-house at the Seed Barn. The current inventory of John and Romans will expand to include New Testaments and, eventually, whole Bibles. These larger products will be made possible by a printing press and other major assets. As we strive to accomplish the divine will in each of our lives, we invite you to join us as a partner in this mighty endeavor, to proclaim the Gospel in writing unto the ends of the earth!